Celebrating the life and songs of Paul Simon: Hey, Schoolgirl, The Sound of Silence, Homeward Bound, I Am a Rock, A Hazy Shade of Winter, Mrs. Robinson, The Boxer, Bridge over Troubled Water, and Cecilia. A friendship developed and grew between Paul and Art as they attended Forest Hills High School together, playing at some school dances under the stage name Tom & Jerry. Paul Simon wrote his first song (with help from his father), called The Girl For Me. Like all baby boomers, Paul Simon was inspired by Elvis Presley, and both Simon & Garfunkel liked and emulated the vocal harmonies of The Everly Brothers. In 1957, the sixteen-year-old duo calling themselves Tom & Jerry had a #49 hit single Hey, Schoolgirl, which they performed on American Bandstand. Below, audio of Tom & Jerry (Simon & Garfunkel) singing Hey, Schoolgirl circa 1957. Further musical success eluded "Tom and Jerry", and the two friends went their separate ways scholastically and professionally after high school. Paul Simon attended Queen's College in New York and Art Garfunkel went to Columbia University. While attending Queen's College, Simon met fellow singer-songwriter Carole King, and a new friendship was born. He also continued to write songs, and using the professional name of Jerry Landis, Paul Simon recorded and released solo singles during his university years. 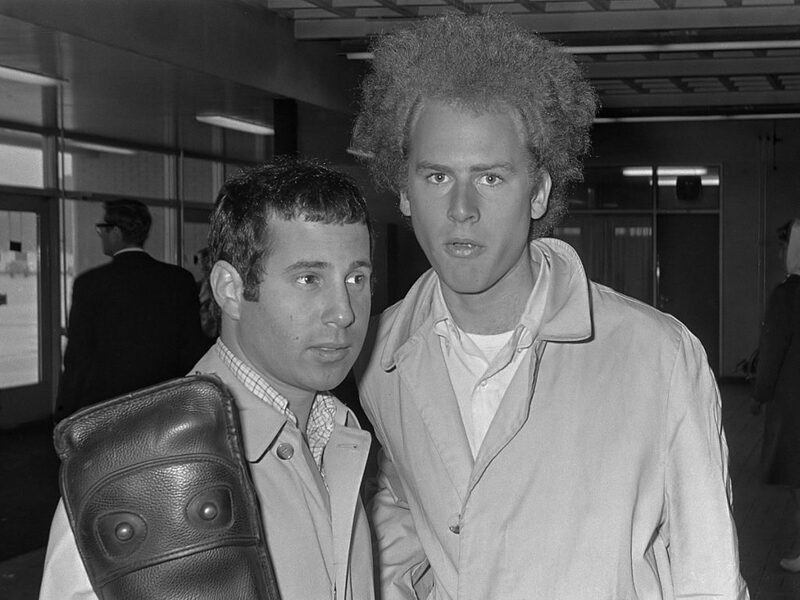 After graduating from Queen's College in 1963, Paul Simon met up again with Art Garfunkel. They began performing as a folk duo, and Simon enrolled at Brooklyn Law School. A performance by Paul Simon and Art Garfunkel under the name Kane & Garr of a song Simon had written called The Sounds of Silence, got them a recording contract in 1964. Paul Simon has said he wrote the song in his bathroom when he was 21; he liked to play his guitar in the dark and listen to the echo, which inspired the lyrics "Hello darkness, my old friend". The Sounds of Silence was included on their first album - Wednesday Morning, 3 A.M. (1964), which flopped. Simon and Garfunkel broke up and Paul Simon quit law school and went to Europe. While in Europe, in early 1964 22-year-old Paul Simon met and fell in love with 17-year-old Kathy Chitty in England. Several of the songs Paul Simon wrote during this time either mention her name - America, Kathy's Song - or reference her, such as Homeward Bound and The Late Great Johnny Ace. Solo songs on the The Paul Simon Songbook album included The Side of a Hill, I Am A Rock, Kathy's Song, and The Sound of Silence. In 1969 Paul Simon requested The Paul Simon Songbook album be deleted, but it never was. In September 1965, a re-mixed production of The Sounds of Silence was released as a single with the new title The Sound of Silence, and the song began to climb up the charts. Paul Simon returned to the U.S. and in January of 1966, The Sound of Silence hit #1 on the music charts. The Sound of Silence has been featured on television and feature films, most notably The Graduate (1967), Old School (2003), and Bobby (2006). BMI has said it is one of the 20 most-performed songs of the 20th century, and many artists have covered The Sound of Silence, including a 2015 version by the metal band Disturbed. Below, Paul Simon & Art Garfunkel sing The Sound of Silence live in 1967. Although the professional success was heady, Simon's budding romance with Kathy Chitty had ended soon after her returned to the U.S. ; she was extremely shy and didn't want to be caught up in his limelight. On the success of The Sound of Silence #1 single, Paul Simon and Art Garfunkel reunited and began recording more singles and albums. They met agent Mort Lewis, who introduced them to his younger wife Peggy (nee Harper). Mort Lewis became Simon & Garfunkel's manager, and remained so until 1970. Simon & Garfunkel's second album - Sounds of Silence (1966) - was released in January 1966 and had the single I Am a Rock (1965) written by Paul Simon. Simon & Garfunkel had recorded of I Am A Rock in December, and when it was released in the spring of 1966, it rose to #3 on the charts. Below, Simon & Garfunkel perform I Am A Rock in a vintage live music video. Simon & Garfunkel's third album Parsley, Sage, Rosemary and Thyme (1966) came out in October 1966 and yielded two top 15 songs that baby boomers loved. Scarborough Fair/Canticle (1968) incorporated revised lyrics from Simon's earlier song The Side of a Hill and the old English folk ballad Scarborough Fair and was a #11 hit for them. Homeward Bound (1966) had been written by Paul Simon while he was touring in England and missing Kathy Chitty in 1964, and made it to #5 after it was released as a Simon & Garfunkel single. Among the numerous artists that have covered Homeward Bound are Cher, Glen Campbell, Petula Clark, and Cliff Richard. Below, Simon & Garfunkel sing Homeward Bound in 1967. Below, an older Paul Simon & Art Garfunkel reunited for a concert in 1981, and sing Homeward Bound. The Simon & Garfunkel single A Hazy Shade of Winter was written by Paul Simon and released in October 1966, climbing to #13. It wasn't included on an album until Simon & Garfunkel's fourth album Bookends was released in April 1968. The Bangles recording of A Hazy Shade of Winter (1987) made it to #2, surpassing the original artists; A Hazy Shade of Winter was re-released as a single by Simon & Garfunkel in 1991. Simon and Garfunkel perform A Hazy Shade of Winter in 1966, below. Mrs. Robinson (1968) written by Paul Simon for the movie The Graduate (1967) starring Dustin Hoffman, Katharine Ross, and Anne Bancroft, was also included on the bookends album. Mike Nichols, the director of The Graduate, declared the woman in the song would be Mrs. Robinson (Simon had originally written it as Mrs. Roosevelt). The lyrics of Mrs. Robinson reference baseball great Joe DiMaggio: "Where have you gone Joe DiMaggio", whom Paul Simon later met. "In these days of Presidential transgressions and apologies and prime-time interviews about private sexual matters, we grieve for Joe DiMaggio and mourn the loss of his grace and dignity, his fierce sense of privacy, his fidelity to the memory of his wife and the power of his silence." Joe DiMaggio had been married to Marilyn Monroe and even after their divorce, was supportive of her. DiMaggio never remarried, and although he never spoke to the press about their relationship, he had red roses delivered 3x weekly to Marilyn Monroe's grave for 30 years after her death. Below, classic scenes and song Mrs. Robinson, from the movie The Graduate. Mrs. Robinson became a #1 hit single for Simon & Garfunkel after it's April 1968 release, and won two 1969 Grammy Awards; Record of the Year, and Best Contemporary-Pop Performance - Vocal Duo or Group. Like many other songs written by Paul Simon, numerous artists have covered Mrs. Robinson, including Frank Sinatra, The Lemonheads, and Jon Bon Jovi. In the fall of 1969 Paul Simon married Peggy (Peg) Lewis Harper, who had recently gotten divorced from his manager Mort Lewis. Mort Lewis remained on good personal and professional terms with both Peggy and Paul Simon, and attended their wedding. The #7 hit single The Boxer (1969) was written by Paul Simon and released in March 1969. Since then, Neil Diamond, Emmylou Harris, Mumford & Sons, Bob Dylan, Joan Baez, and numerous other artists have recorded or performed The Boxer. New Yorker Paul Simon sang The Boxer when he opened the first Saturday Night Live show after the September 11, 2001 attacks on New York City. Below, a live performance of The Boxer by an older Paul Simon & Art Garfunkel. Simon & Garfunkel's fifth and last studio album was Bridge Over Troubled Water (1970), released in January of 1970. The Bridge Over Troubled Water album went to #1, thanks again to their baby boomer fans. In addition to the previous year's hit single The Boxer, the album contained two more Top Ten hit singles. Written by Paul Simon, the title track Bridge over Troubled Water (1970) was the last #1 hit for Simon & Garfunkel; it stayed at #1 for six weeks after it's January 1970 release. Bridge over Troubled Water was influenced by Paul Simon's interest in gospel music and the last verse "Sail on, silvergirl" references Simon's wife Peggy (Peg) Simon having found early grey hairs. It was Paul Simon that thought Art Garfunkel should sing the lyrics to Bridge Over Troubled Water solo, although Garfunkel initially refused. Below, audio of Bridge Over Trouble Water by Paul Simon. Bridge over Troubled Water won five 1971 Grammy Awards, including Song of the Year and Record of the Year. Since then, Aretha Franklin had a #6 hit and won the 1972 Grammy Award for Best Female R&B Vocal Performance for her recording of Bridge Over Troubled Water, and Simon has been said to like Elvis Presley's live performance as well. In 1998 the Simon & Garfunkel album Bridge over Troubled Water was inducted into the Grammy Hall of Fame. Released in April 1970, Cecilia contained lyrics written by Paul Simon, his brother Eddie Simon, and Art Garfunkel. Cecilia stayed on the Billboard Hot 100 charts for 13 weeks and peaked at #4. Below, audio recording of Simon and Garfunkel singing Cecilia. Paul Simon held a young songwriter's workshop in 1970 and tutored 6 teenagers, among whom was singer-songwriter Melissa Manchester. Manchester's song Ode to Paul, references Paul Simon's support. 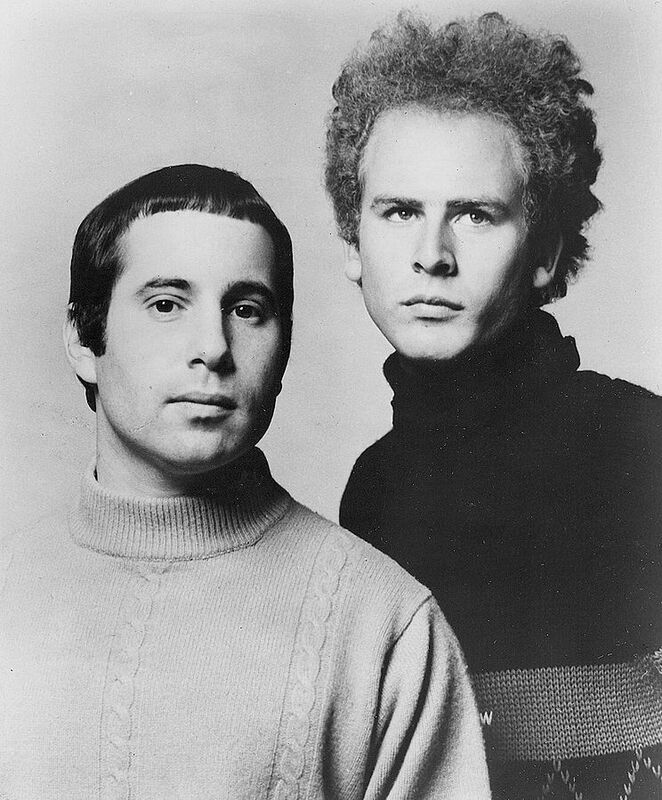 By the end of 1970, Simon & Garfunkel had split up and each became solo artists. Although they have occasionally reunited to perform and even record new material, Paul Simon and Art Garfunkel have never quite recaptured the magic of their 1966-1970 Simon & Garfunkel heyday. Simon & Garfunkel were inducted into the Rock & Roll Hall of Fame in 1990. Paul Simon embarked on his solo career and began racking up more hits during the 1970's and beyond.